Use these Memorial Day Recipes for sharing the day with family and friends in recognition of those who have made the ultimate sacrifice for our freedoms. Some holidays find their beginnings in religion, others celebrate an important historical person, and still others celebrate a particular world culture. Only Memorial Day stands as a holiday that arose out of appreciation for and remembrance of every person who served the nation and the many who gave their lives defending the nation. 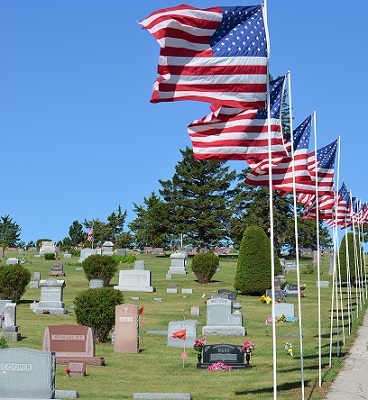 Many people observe this holiday by visiting cemeteries and memorials. Another tradition is to fly the U.S. Flag at half-staff from dawn until noon local time. My family and I usually visit our family grave site in the morning and then meet at one of our homes for an afternoon barbecue, weather permitting. If the weather is poor (we live in the Pacific Northwest), we always have a "backup plan." So here you'll find suggested Memorial Day recipes for your barbecue as well as items you can cook indoors should the weather not cooperate. Mix and match these recipes for a great selection of Memorial Day recipes. 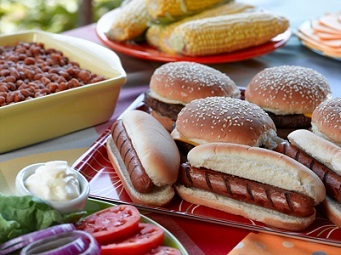 Have a cookout using your grill, and have an easy and relaxing weekend. Fly the flag in remembrance, but spend time with friends and family making new memories that will last forever. That, too, symbolizes what the day stands for. Use Memorial Day to commence an entire year of memories with these perfect Memorial Day recipes. And don't forget, stock up on paper plates, plastic eating utensils, disposable cups and paper napkins. Cleanup will be a snap! Make certain you have enough comfortable chairs for your guests. With Memorial Day we better think about serving some salad. Fresh strawberries and spinach available? Try the restaurant recipe for Spinach and Strawberry Salad. It's really refreshing. Long before I was grown up, long before I had my own family; long before I was a restaurant owner; fried chicken was the heart and soul of every Sunday family dinner and often the center of the plate on special days. The fried chicken I make is as good as Moms. It was her recipe I stole and ...I use a cast iron skillet to fry it, too! Mashed potatoes and gravy (in some areas - rice), fresh green beans or grilled corn-on-the-cob with dinner rolls add to your Fried Chicken. Or potato salad and barbecued baked beans with biscuits or cornbread muffins, to get the summer cooking season off to a memorable start! Let's not forget about some other ways to prepare chicken besides fried. I have a number of chicken recipes on the website but I would suggest you consider the restaurant recipe for Marinated Sesame Sliced Chicken. Yummy! Serve this chicken dish with Sweet Corn Salsa or a wonderful Vegetable Stir Fry and add a fabulous Asian Wild Rice Salad! Or try serving the chicken with a wonderful Chinese Noodle Salad. Feast your eyes on this patriotic recipe - one that will please the whole crowd on Memorial Day. Try some grilled barbecued spareribs with potato salad. That's an American classic you're sure to enjoy. Oops, what if it rains? 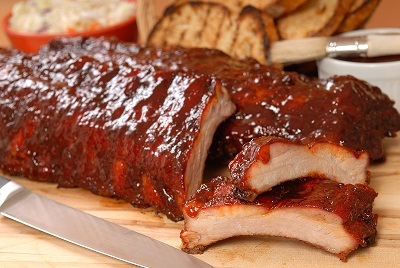 Switch to the recipe to the Slow-Cooker Barbecue Spareribs. Want to grill some Flank Steak? Here is the perfect Grilled Marinated Flank Steak Recipe for you and your family and guests. Serve your Flank Steak with Grilled Asparagus and Cole Slaw. Want burgers instead? Great! But let's make them a little bit special - memorable in fact. Try serving these Favorite Barbecue Hamburgers. What makes these burgers special is the secret restaurant recipe for the barbecue seasoning! 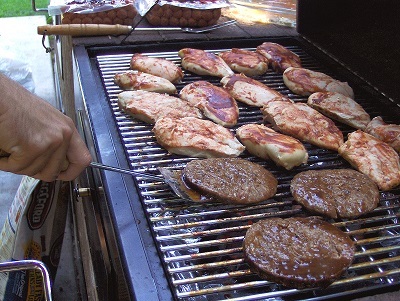 Take a look at this Recipe for Barbecue Hamburgers! Hot dogs? Red hots? Get your red hots here! Some people are not huge fans of hot dogs but many people are, including children. If you want to grill hot dogs since they are an American tradition, I have some special ways to serve the hot dogs that everyone will enjoy. Dessert? Of course we want to offer some dessert. Try making this recipe for Banana Split Cake! What a memorable dessert this will be for your family and guests. Or, if you really want a delicious dessert that will remind everyone what a special day Memorial Day is, serve the Red, White and Blue Parfait! What a pleasant surprise this will be. Want a similar look for your Memorial Day Recipes but want it really simple? Just serve a scoop of strawberry or raspberry ice cream with a scoop vanilla and a scoop of blueberry ice cream. You might also want to check out other suggested menus, besides the Memorial Day Recipes listed here. If so, visit Holiday and Special Day Menus. 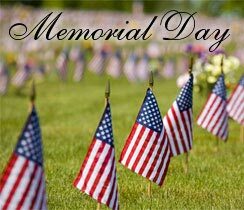 Enjoy your Memorial Day Weekend and the Memorial Day recipes you use and the company of those you share them with!